Crawley, England & Solon, OH – February 11, 2019 — In November, 2018 GEW (EC) Limited and Graphco signed a distribution agreement covering the Midwestern U.S. and customers throughout the region can now access best-in-class LED-UV Technology to upgrade the capabilities, run-ability and productivity of their existing sheet-fed offset presses. 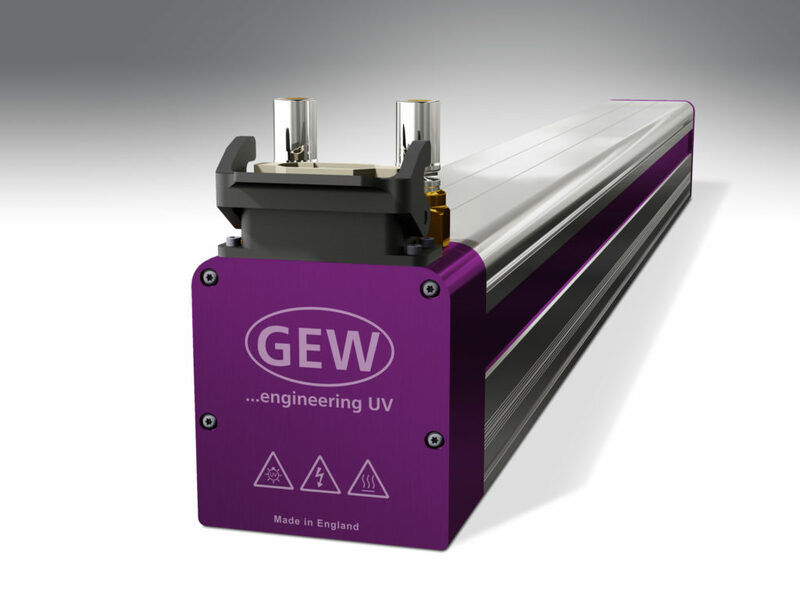 “We feel strongly that working with the Midwest’s market leader in printing equipment will provide GEW with the best chance to help printers upgrade to the most effective LED UV curing technology,” states Malcolm Rae, Managing Director and owner of GEW. While UK based, GEW has a market leading global presence in the narrow web flexo industry and many installations in other print and industrial applications like wide format, label and mailing inkjet, digital and even metal decorating. These successes have strengthened their sheet-fed capabilities. “As we evaluated the various after-market LED-UV systems, we focused on the strength of both the technology and the company that stands behind that technology. GEW stood out in both ways and having a fully staffed US sales and technical support facility right here in Ohio was a key advantage for Graphco and our customers,” comments Chris Manley, President of Graphco. One of the prime examples of technology leadership is GEW’s heavy use of IoT (Internet of Things) technology which allows seamless real time technical support from GEW‘s technical headquarters. Using this technology, GEW engineers can monitor, diagnose and even predict if a customer’s lamp needs attention and then a very quick resolution can be provided over the IoT. Lamp cooling is another key strength for GEW, and although LED-UV is a cool running technology, even lamp head cooling means longer life for LED-UV diodes and more consistent curing on press. Using patented technology, GEW LED-UV lamps maintain consistent cooling across even the longest VLF (40″-81″) lamps so customers can run at full press speeds with consistent results and total reliability. 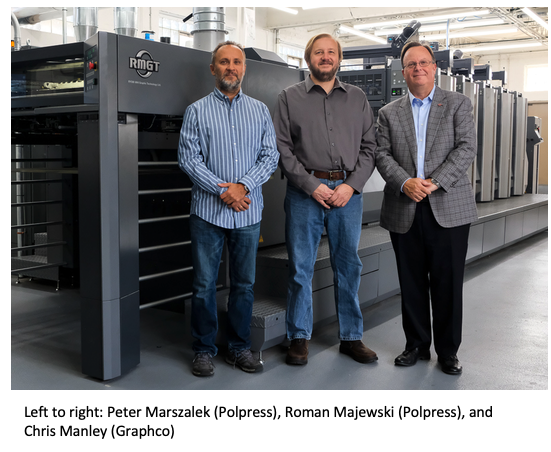 Ranked number 223 on the PI 400, Graphic Village in Blue Ash, Ohio recently joined Martin One Source in Champaign, Illinois and PolPress from Chicago by installing RMGT 940ST-5+CC+LED-UV presses powered by GEW in the last 2 quarters of 2018. Another PI 400 company, Hagg Press in Elgin, Illinois also installed a 40″ RMGT 1020ST-5+CC+LED-UV powered by GEW LED-UV in late fall of 2018. All four of these RMGT presses are now providing the ultimate in print quality, productivity and consistency to these fine companies and having GEW LED-UV curing on press is opening doors for projects and production timelines that would not be possible without instant ink drying. Graphco is the industry’s leading provider of offset, digital and print finishing solutions. We proudly represent the finest brands of equipment including RMGT (Ryobi MHI Graphic Technology), GEW LED-UV, Foliant, Konica Minolta, Standard Horizon, CRON-ECRM, Graphic Whizard, Petratto, Spiel Associates/Sterling, MBM, and many more. These brands are only as good as the technical support team that stands behind them and Graphco’s reputation for top-notch service is second to none. Since 1976, Graphco has thrived in an ever-changing market place by loyally adhering to the firm’s original model for success: providing best-in-class print production equipment along with reliable and assured technical service. Learn more about Graphco at www.graphco.com, 800-458-2769. GEW equipment is used on by many of the world’s most advanced printing machine manufacturers. Their products are highly regarded for their standard of engineering, reliability and performance and their fast, friendly and flexible approach has kept customers loyal to them over many years. As testimony to this, their first ever customer is still buying from them today.